You’ve lost your wallet with your driver’s license, credit cards, and money just withdrawn from the ATM. Quick — who ya gonna call? Chances are, if you’re like most Catholics, you’ll enlist the aid of St. Anthony of Padua, renowned for his ability to recover everything from a missing child to a misplaced set of house keys. But this is only one of the many powers attributed to this extraordinary saint, acknowledged as one of the greatest miracle workers of all time. He began his remarkable life at Lisbon, Portugal in 1195 and was christened “Fernando.” Little is known of his early years. Experts cannot even agree on his parents’ names, but it is generally believed they were wealthy members of the nobility. He was educated at the Cathedral school in Lisbon, and at the age of 15 joined the Canons Regular of St. Augustine. In 1212 he was transferred to Coimbra in order to devote himself more fully to prayer and study, away from the distraction of frequent visits by family and friends. In 1220, Don Pedro, Crown Prince of Portugal, brought from Morocco the relics of the first Franciscan martyrs. Seized with a new zeal to be a missionary and martyr, he left the Augustinians to join the Franciscan Order, founded about a decade earlier in Assisi by Francesco Bernardone (who would become known as Francis of Assisi). He took the name Anthony after Antony of Egypt, founder and father of organized Christian monasticism. Shortly thereafter, he was permitted to go as a missionary to Morocco, but God had other plans for him. Immediately upon his arrival, he became so ill with malaria that he was forced to return to Europe. The ship on which he booked passage was diverted off course by severe storms and docked in Sicily. He recuperated there for several months, then went to Assisi, where he was assigned to the hermitage near Forli, a town outside Bologna. Although a brilliant scholar with a profound knowledge of Scripture, his great humility caused him to say nothing of his scholastic achievements. He lived quietly, serving the other Brothers and working in the kitchen. One day, he accompanied some other Friars to Forli for an ordination. At the last minute there was no one available to preach, and in desperation the Superior asked Anthony to speak whatever the Holy Spirit prompted. Things would never be the same again! Although timid at first, Anthony was soon preaching so eloquently and fervently that everyone was amazed. Thus began the aspect of his public life for which he would become the most renowned: preaching. “When the Holy Spirit enters a soul,” he wrote, “He fills it with His fire and lets it enkindle others.” He had all the qualities of a successful preacher: a charismatic presence, clear, resonant voice, attractive appearance and magnetic personality. Although the Franciscans were guarded in their attitude toward book learning, Francis was so impressed by Anthony’s newly-discovered ability that he appointed him as teacher of theology to the Franciscans. During the remainder of his short life, Anthony’s achievements were astounding. Crowds numbering over 30,000 flocked to hear him speak. He preached so forcefully against heresy, he became known as malleus hereticorum, “Hammer of the Heretics.” Thousands of conversions followed his compelling sermons, and miracles abounded wherever he went. Many of these miracles are legendary: Along the coast of Rimini, fish rose out of the water as he preached. Poisoned food offered to Anthony by his enemies was rendered harmless after he made the sign of the cross over it. A young man’s amputated foot was miraculously restored at Anthony’s touch. In 1226, after the death of Francis of Assisi, Anthony eventually made his home in Padua, where he was greatly revered. During Lent in 1231 he preached a powerful series of sermons that were to be his last. Shortly after Easter he became fatally ill with edema, and died in Vercelli on June 13, 1231, at the age of 36. Immediately after his death he appeared to Thomas Gallo, the Abbott at Vercelli. Numerous miracles followed, and he was canonized on May 30, 1232, less than a year later — one of the fastest canonization processes in the Church’s history! Pope Gregory IX, who had known him personally, called Anthony the “Ark of the Covenant,” because of his prodigious knowledge of Holy Scripture. So how did he come to be regarded as “Finder of the Lost?” It all began with a cherished book of Psalms belonging to Anthony, in which he kept written notes for use in teaching theology to the friars. One day a novice suddenly deserted the monastery, taking with him, for reasons unknown, Anthony’s precious Psalm book. Anthony pleaded with Heaven for its return. The novice soon had a change of heart and not only returned the book, but rejoined the Franciscan Order. After Anthony’s death, people invoked his help in finding lost and stolen things, and so many of these were recovered that he became known as the patron saint of lost articles. His patronage also includes: amputees, animals, barrenness, boatmen, donkeys, the elderly, expectant mothers, fishermen, harvests, horses, mariners, Native Americans, the oppressed, the poor, Portugal, the Tigua Indian tribe, travelers, against shipwrecks and starvation. 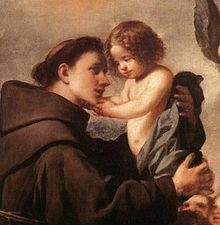 In paintings St. Anthony is often depicted holding the Child Jesus. This custom dates back to a 17th-century legend which says that while staying at a friend’s house, Anthony was spied on by his host, who found him in a state of rapture with the Christ Child in his arms. Holy Saint Anthony, gentle and powerful in your help, your love for God and charity for His creatures, made you worthy, when on earth, to possess miraculous powers. Miracles waited on your word, which you were always ready to request for those in trouble or anxiety. Encouraged by this thought, I implore you to obtain for me (request). The answer to my prayer may require a miracle. Even so, you are the Saint of miracles. Gentle and loving Saint Anthony, whose heart is ever full of human sympathy, take my petition to the Infant Savior for whom you have such a great love, and the gratitude of my heart will ever be yours. Amen.